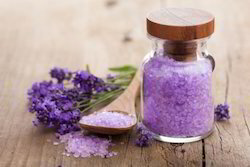 Bath salts are powdered minerals and salts added to bath water/foot soaks to provide a relaxing and beneficial experience while adding colour and fragrance to bath water. Bath salts can provide calming, energizing, disinfecting, and anti-aging among many other benefits. They were developed to mimic the natural mineral baths. Pamper yourself with the most luxurious form of relaxation that contains marine salt, along with natural essential oils to exfoliate, soothe and moisturize that leaves you feeling soft, fresh and relaxed. Aura bath salt is a combination of epsom salt, Himalayan pink salt, dead sea salt, essential oils and herbs. Use it once ans feel the change. Pack Size: 250 gr / 8.8 oz. We are manufacturer & exporter of Rock Salt Products, specially Bath salt, fine salt, granulate salt & color scented salt. Our Granulate and fine salt is used for edible. Our Granulate and fine salt is also used for BATH. We have very special color scented bath salt.